We will be kicking off our Chevron Learn to Row program with two information sessions, on Tuesday, June 5 at 6:00 p.m. and Saturday, June 9 at 10:00 a.m. The session will take place in the erg room at the Boathouse. Anyone is welcome to attend these sessions and it is open to all ages (10 & up). Feel free to bring your friends or come down solo! We will do our best to find a crew that is best suited for you. If you are interested in attending one of these sessions please RSVP to LTR@stjohnsregatta.com. Starting on Tuesday, June 4, we will continue to provide training for new rowers wishing to participate in the sport of fixed-seat rowing through our Chevron Learn to Row Program. The goal of this program is to provide a free opportunity for community members to try fixed-seat rowing. If you are a new rower with a full crew (six rowers), or an individual rower looking to get your foot in the door to create a new group, this program may be what you are looking for! 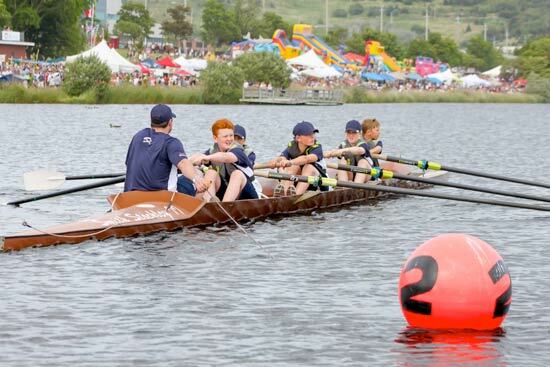 We will teach participants the fundamentals of fixed-seat rowing and provide a comprehensive understanding of the rowing operations at Quidi Vidi Lake. This includes individual and group sessions, Rowing and Boat Orientation, Technical Rowing Instruction and on-water mentoring. Do you want to increase your physical activity level, be a part of a long-standing tradition in St. John’s and think this program may be for you? For more information on how to get started, contact our Chevron Learn to Row Coordinator at LTR@stjohnsregatta.com. Please fill out the application and waiver form to participate. The program is open to participants of all age categories and fitness levels.